I have met so many wonderful people through blogging. Some in real life, and some online. Ruth is one of those people. I think her blog is one of the best on the internet. And I'm still trying to figure out what she sees in me. She's young and gorgeous, single and stylish. She lives a fab life in England, travels with friends, goes to pubs and wears flowers in her hair. Occasionally she'll pop in here with a comment that makes me laugh out loud. And sometimes I open my mailbox to find a lovely surprise package from her. 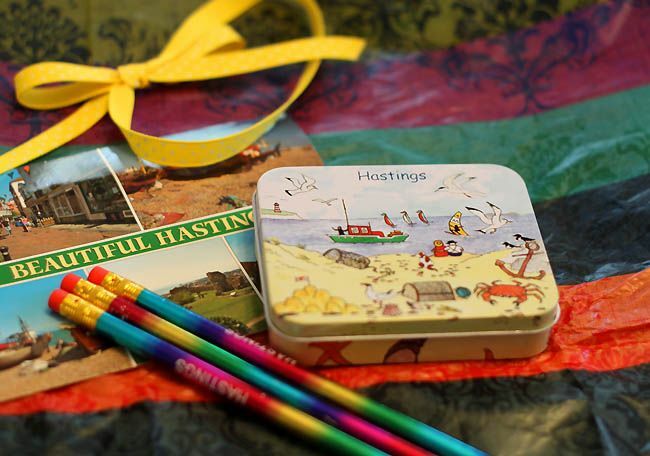 There was a little note inside that said, "From one beautiful Hastings to another." I really must make it to England some day. Have you made real friends online? Oh how sweet! I have made a few blog friends and some from some swaps I was in. Would love to meet some bloggers from my area someday! I've got a bloggy friend coming to stay here in a couple of days! Fun! So Beki, when are YOU coming to visit me? From the old AOL message board days, I became friends with a group of 7 women when we were all pregnant with our babies and due in the same month of 2003. Our "babies" are now 2nd graders, and we are all still friends. Wendy, when I make it to WA I most definitely want to meet up with you!! You just can't tell anyone what a dork I am in real life. Beki....what's the web address for Ruths' blog....would like to check it out. P.S. Still need the specs on your ad spaces so I can send mine over, thx! And yes - some of my blogging friends have become some of my best IRL friends. Others, whom I have still yet to meet, I literally MISS if we don't connect in a couple days. Weird? I don't think so. England, pubs, flowers in your hair...sounds fab! I <3 bloggy friends! Friends from the internet are amazing...I have tons of them. In fact, my husband and I met through an online forum. It's an amazing way to meet people with similar interests that you never would have met otherwise!! I do have really great friends I met blogging. Just wonderful people here! I too think England is a must, only I could just pack up and move there!! What a sweet package, I love stuff like that! That is awesome, how sweet and touching. This internet world is a funny funny thing. I feel like I have friends all over the US and world for that matter, but half of them don't know I exist! Ha! When there is a person who blogs daily about their life I feel like I know more about them sometimes than I do about my real life friends that I catch up with once a week or so. Some of them (you included) I feel like I relate to so much that if we lived close we really would be best friends. So my husband continues to laugh at me when I talk about my "friends" like I've known them my whole life. People that don't blog or read blogs don't get it. It's a hard thing to explain. i have made friends online! in fact my onlive friends are sometimes the only adult conversation i get in a day....sad??? yeah, i know. we really need to meet IRL!!! yes I've made friends on the internet, some of which I've known over 5 years now. Never met IRL. Wondering though, what do you call these people? i am mortified - my blog is a heap of something and nothing, more often than not nothing, don't go getting peoples' hopes up!! what do i see in you??! What a sweet friend to send you little presents! I've met 3 people on etsy that I've gotten to meet in person. So much fun! I have an online friend I met through ebay several years ago. She lives far away in Texas so I don't know if we'll ever meet...but we always enjoy emailing. I consider you my "blog friend" even though we have never met. I started reading the Macs blog when Cora was sick and have stuck with it and all their friends, too! I call you my "friends from Kansas". My husband says I'm a stalker.....whatever! Have a great week, friend! I think meeting people is so neat...and that sounds like a great bloggy friend to you! Yes, I have a bunch of internet friends that make my world so much brighter! And I love sending them Happy Mail.